Another piece on the shortlist for inclusion in Profilia, a forthcoming anthology of profiles that I hope to publish this summer. This is an excerpt from my profile of Larry Hoffman, guitarist, blues historian, classical composer who often incorporates the blues into his compositions. In middle school, Hoffman took up banjo, passing on guitar for the time being because guitar seemed too cowboyish, too Gene Autry, and he wanted to learn songs by Earl Scruggs and other banjo pickers. He might not have cared to read music, but he enjoyed reading about music, and soon began perusing issues of Sing Out! and The Little Sandy Review to learn the lyrics of folk songs. His life as a music scholar had begun, and he started digging deep into the history of whatever interested him. In those days, near the zoo on McMechen Street, Baltimore had a record store called the HiFi Shop, and the adolescent Hoffman would dig through the bins looking for rarities. 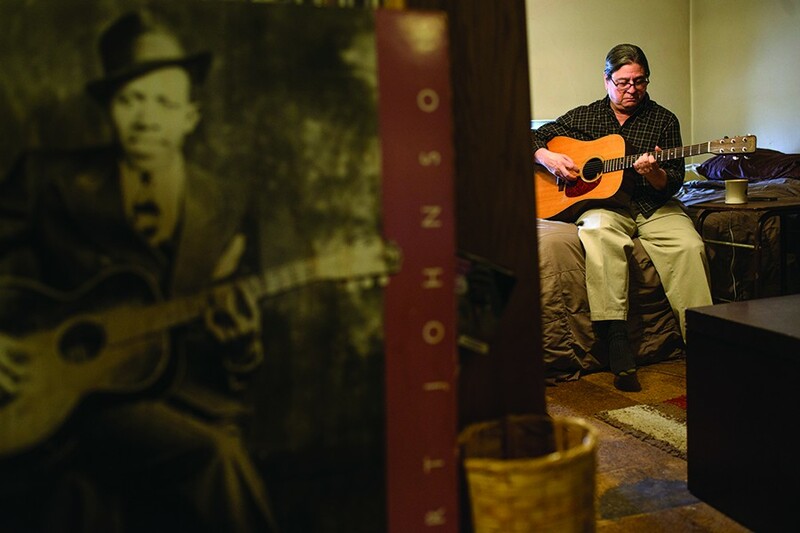 He bought obscure 45s by mail order and pored over the liner notes of new releases on the Folkways label. Years later, he discovered the great collections of folk musicologist Harry Smith and began to realize that the popular folksingers and pickers who he thought had created this music actually had cadged tunes and lyrics from progenitors like the Skillet Lickers, Doc Boggs, and Blind Lemon Jefferson. Music had a history and Hoffman discovered that he loved delving into it. By 14 he was playing a guitar, Gene Autry be damned. He kept it at the foot of his bed. He recalls it as the first thing he saw upon opening his eyes in the morning and the last thing he saw at night. He would go into his father’s downstairs workshop and play at 4:30 in the morning, which his father did not always appreciate. By high school, he was playing guitar, banjo, and autoharp in a folk group, and singing harmony. He says the first Bob Dylan album haunted him. When he was 17, he formed a short-lived trio called Larry, Larry, and Chuck with a pair of college students, Larry Miller and Chuck Aaron. “We argued a lot,” Aaron says. “We used to fight over arrangements and stuff like that. He was the youngest one, so he got outvoted. In retrospect, we probably should have listened to him a little more.” A group of girls, including Aaron’s future wife, would listen to the band rehearse. They giggled so much the musicians called them The High Frequencies. There was a club in town called The Flambeau and it offered the band a Wednesday night gig. Not on a school night, his mother ruled.